Wondering how far a small bicycle can go. 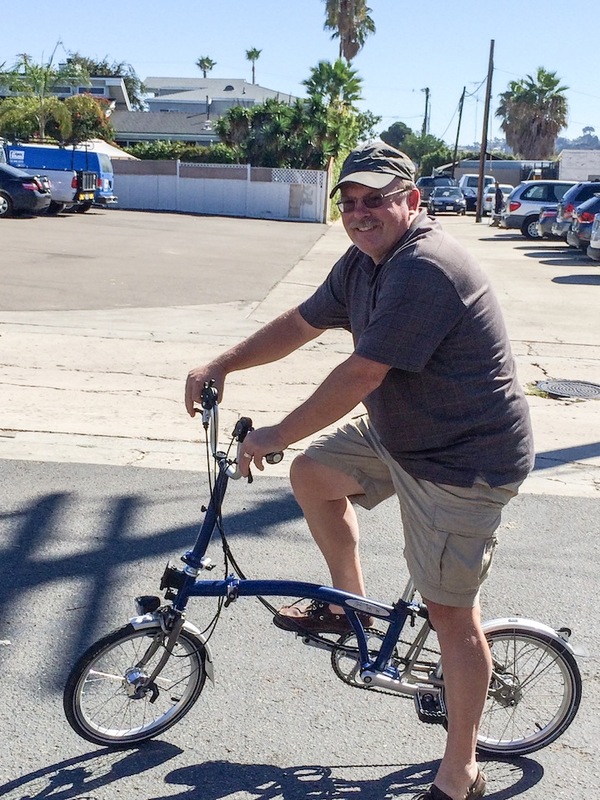 Bill Tracy sells Brompton and Tern folding bikes. He commutes to work using a combination of bicycle, car and trolley. Here’s how you find Bill Tracy’s two-year old bicycle shop. In the continental United States, go as far west as you can, then follow the coast south until you’re about 25 miles from the Mexican border. Look for palm trees near a tile-roofed strip mall. One of the nation’s shortest all-glass skyscrapers is probably still for lease across the street. Can’t miss it. And you shouldn’t miss talking with Bill. So, where are we, Bill? 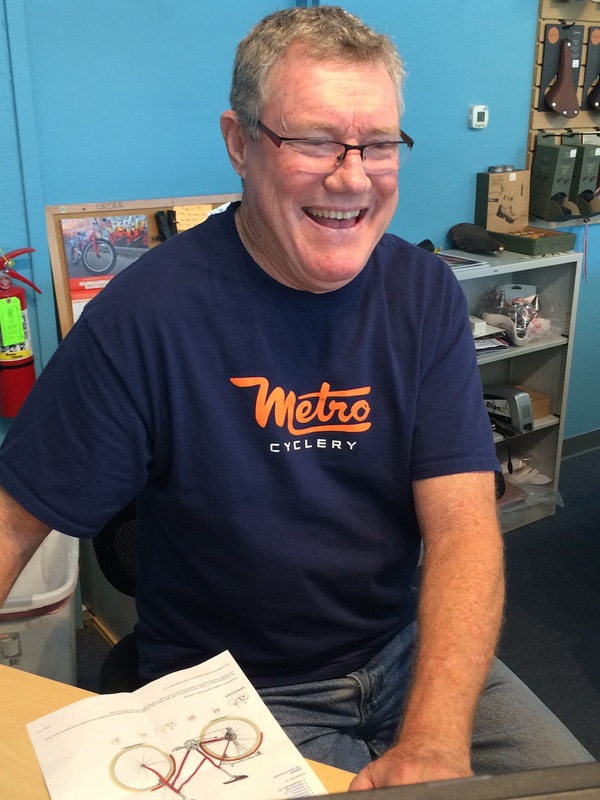 Cruisers and folding bikes dominate sales at Metro Cyclery. This is technically Linda Vista/Morena District, but we are near the junction of Interstate 8 and Interstate 5, which is centrally located near Mission Bay, Sea World and downtown. And how did you get here? Well, for most of my working life, I was in the building materials supply business, which I sold in 2000. I’ve always had a passion for bikes so I decided to go to bike mechanic school to learn how to work on my bikes. From there I ended up working at a couple of shops near Palm Springs part time and learned that I really enjoy the biking business. But then all our kids started having babies down here in San Diego and decided to move back to be near them and open my own shop. Seems to be a strong affinity between Nutcase helmets and folding bikes. I noticed the folders as soon as I came through the door. 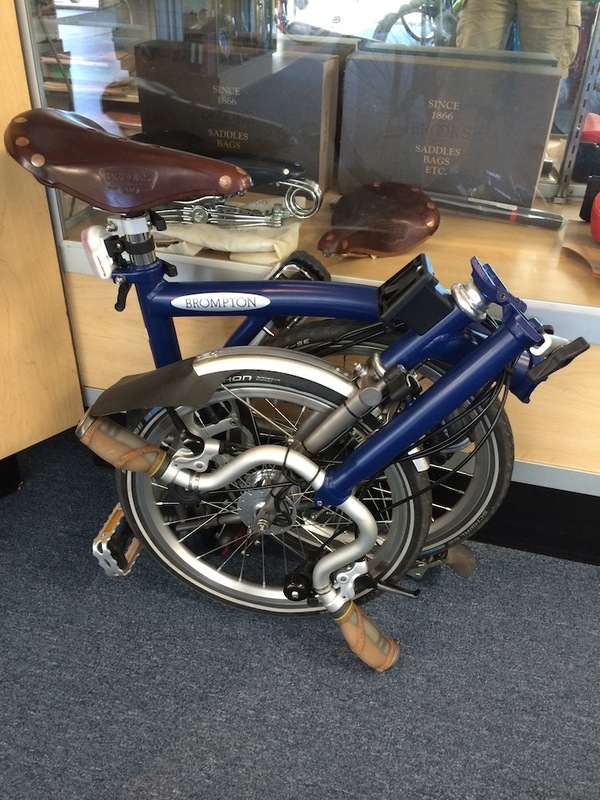 Yes, we carry Brompton and Tern folding bikes. We carry Yuba cargo bikes, which we’ve been selling quite a few of lately, mostly to young families. It’s kind of a minivan replacement. The bottom one there is an electric one, the elBoda Boda, and then we also carry Electra beach cruisers and Townies. You can pack a lot of Bromptons and Brompton bags into a small space without making it cramped. 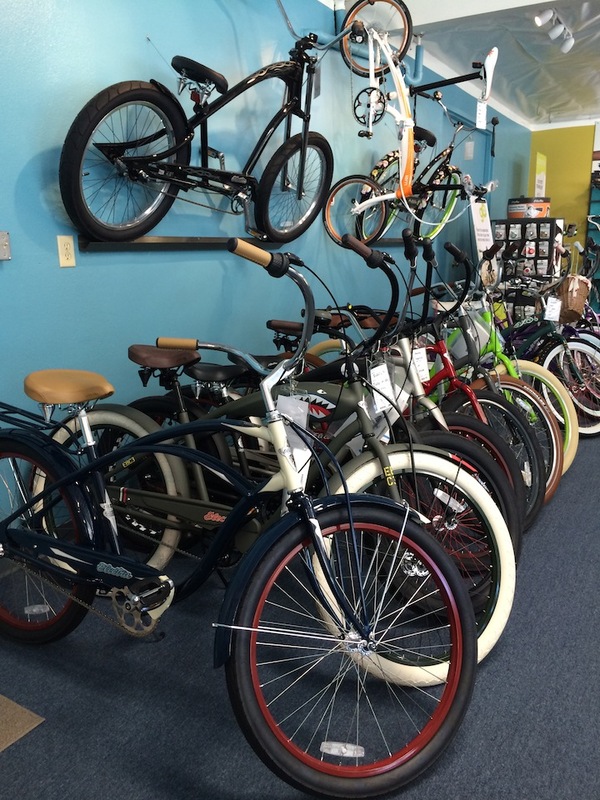 As far as numbers of bikes, that’s the one we sell the most of for riding around the bay. Electra’s Townie is the best-selling bike in North America, so we sell a lot of them. We also carry several more commuter-oriented bikes. The Breezer–we carry several of their commuter-type bikes. 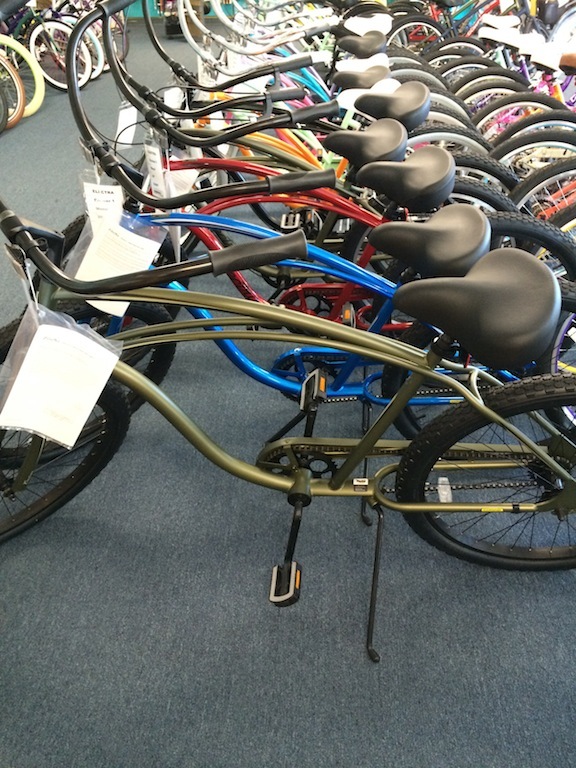 Cruiser bikes and the folding bikes are the ones we sell the most of. And the Townie. Electra’s “Flat Foot Technology” (note the forward crank location on these cruisers) gives riders decent leg extension and the ability to stop while seated with both feet flat on the ground. Perfect for nearby and ultraflat Ocean Front Walk and its eight-mile-per-hour speed limit. 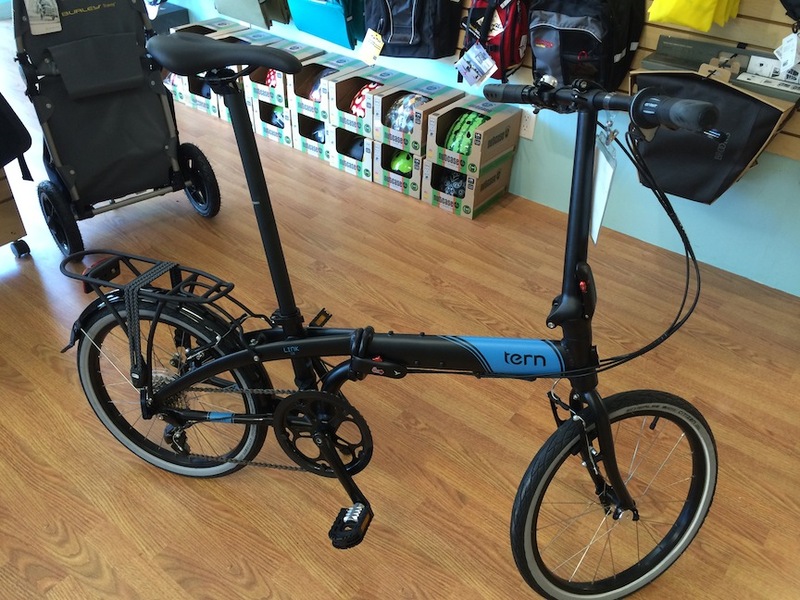 How did you decide on Brompton and Tern? I think they’re the two best brands of folding bikes. I knew when I opened the shop that I wanted to carry Brompton. I also wanted to carry another brand that had a lower price point, and Tern seemed the better choice in terms of quality and value. We sell a lot of folding bikes to commuters, people who like to travel by plane, boat, or RV, and to students or people who are space conscious. 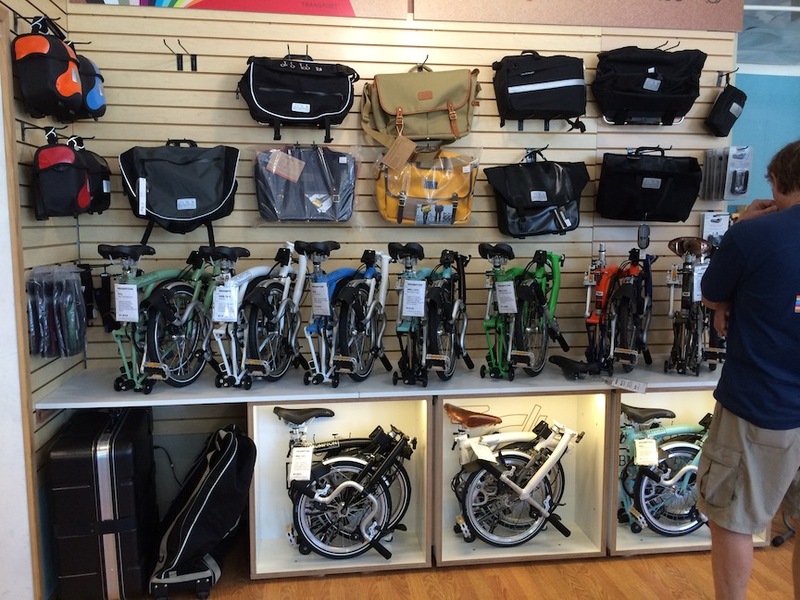 We sell more Bromptons than Terns, but we sell quite a few of both. Brompton folding bikes come in a lot more colors than red and black. 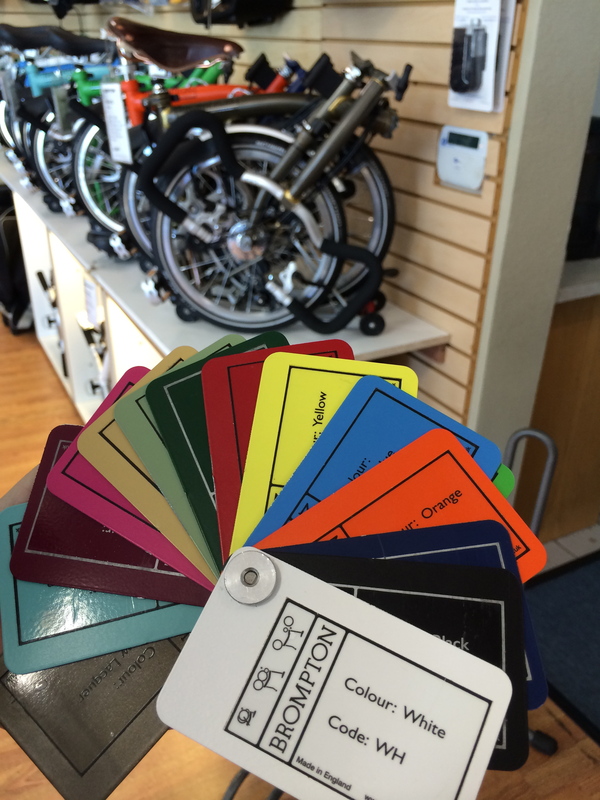 Metro Cyclery carries the rainbow. The Bromptons are more portable. That’s one of the big differences between the two. They fold up smaller, so if the space thing is an important consideration, that might tip someone toward the Brompton, because it’s easier to deal with the folded bike. When the Bromptons are folded you can pull them along without carrying them. They fit into tighter spots. A guy who has a big boat bought two yesterday. Tern has different models for different things. They have some that are like racing bikes. And they have bikes that start at about half the price of the Brompton, so that’s a consideration for some. If you’re looking at a bunch of bicycle shop pictures and you see a racy white-and-orange Tern Verge X10 suspended above a line of massive cruisers, you may have found your San Diego album. You can get into a nice folding bike for less money than the Brompton with the Tern. Tern’s best-selling bike is this one here, the Link D8, and it sells for about half what the Brompton sells for. Least terns are endangered birds in California, but when it comes to bicycle sales, the Tern Link D8 is among best of breed. What do you ride to work? I live in the east part of San Diego County, a town called Alpine, so I drive down the hill from Alpine to El Cajon and then ride the bike in from there. My commute into work is 20 miles one way, and there are a couple-three decent hills in there. For five months I was riding a two-speed Brompton, one of our demo bikes, and it was doable on the trip in, but I had to work pretty hard on a couple of the hills. So when I decided to get my own Brompton, I got a six speed. It’s got a wide-enough gear range to go pretty much anywhere, and so I ride it in two or three days a week. Cruisers are great near Mission Beach, but it was a lot easier climbing the hill behind Metro Cyclery on a six-speed Brompton. This is Bill Tracy’s personal commuter, complete with front generator hub and lights. If my wife is working that day, she’ll swing by with the car after work, pick me up and take me home. Otherwise, I just ride a half mile up to the trolley station here, fold up my bike and hop on the trolley, and take it back out to my car. There’s no better way to sell parts and accessories than by sharing your own experience with them. I bought the Sella Royal Mano Grips after riding Bill Tracy’s Brompton. One of the options on a Brompton is a Brooks B17 saddle, so I have that on a couple of my bikes. I really like that saddle. Brompton also offers a whole bunch of bags that clip on the front of the bike. Mine is a bag called the S-Bag, but they make an open basket that’s really popular and a high-end bag called the Game Bag that’s new as of a few months ago. Lots of options to carry things on the bike. Where do your customers come from? They come from all over San Diego County. Many come down from Orange County and Riverside County, and we do a lot of business with people who live in Mexico, that live in Mexico City. We’ve sold a lot of folding bikes to those folks. Business has been good and it’s been a busy summer. It’s only our second year, so we’re still getting our feet on the ground. 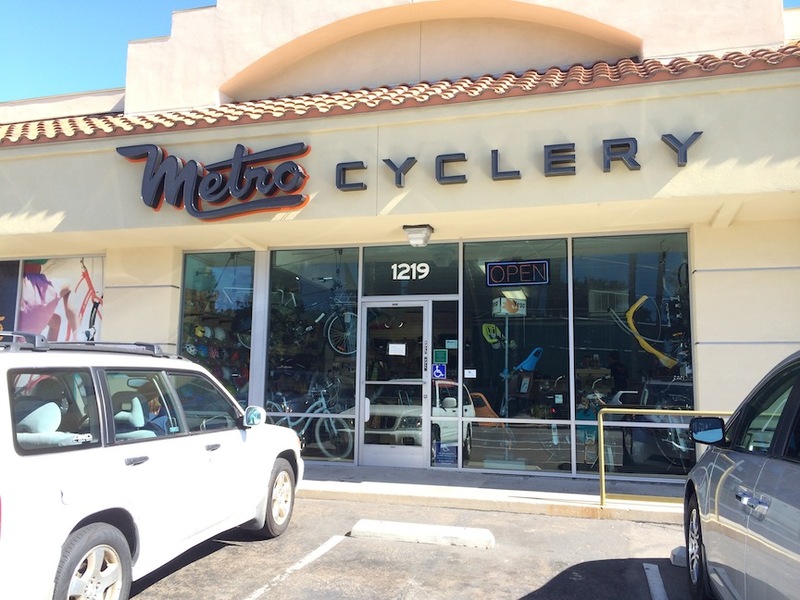 You’ll find Metro Cyclery at 1211 Morena Boulevard in San Diego. Look for the colorful Nutcase helmets just inside the door. Bill also sells Arkel bags, including three models I use: the Bug, the large Handlebar Bag and the TailRider Trunk Bag. If the shop were any closer to me, my budget would be in real trouble. But I limited the visit’s monetary damage to a pair of moderate-style Sella Royal Mano Grips that I want to compare to the Ergon grips on my Bike Friday tikit. Note to Co-Motion’s Dwan Shephard: Might want to send a tandem brochure down to San Diego. Bill’s making noise about getting a new tandem with a Rohloff hub and belt drive. 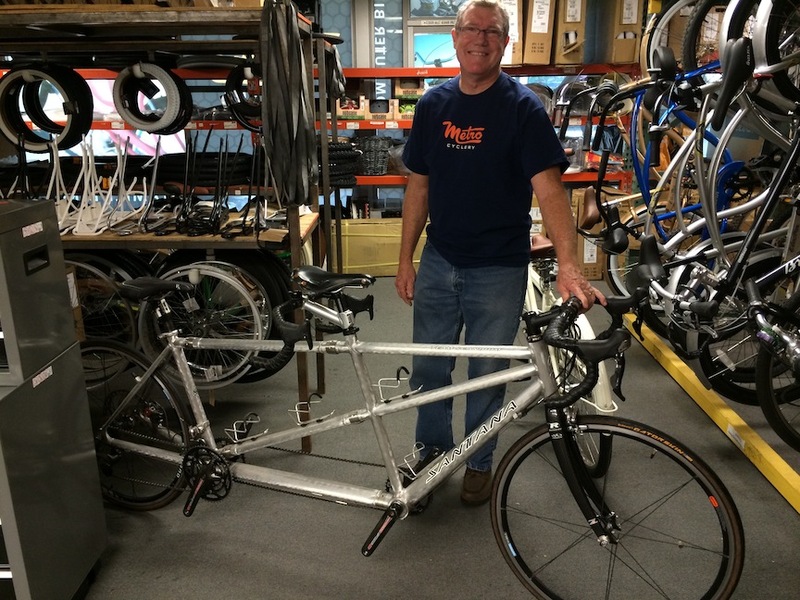 Bill puts in quite a few miles each year on his S&S-coupled Santana tandem with Shimano Sweet-16 wheels. Former bicycle mechanic, current peruser of books, feeder of birds. This entry was posted in Brompton, Business, Other bicycles, Tern Bicycles and tagged bicycle shop, Bill Tracy, commuting, folding bicycle, Metro Cyclery, multi-modal transportation, San Diego, Santana. Bookmark the permalink. Thanks for talking with me–and letting me ride your Brompton. Judging from my brief visit, it’s almost always a good day to pedal a bicycle in San Diego.